It’s a truth not universally acknowledged that good can come from bad. As Iyov said, “Who can bring purity from impurity, not the One?” (14:4; see Targum Yonasan). An untruth almost universally asserted is that race relations in the United States are in a hopeless state. Although Jim Crow laws days lie more than a half-century in the past, Americans of all shades live and work side by side and “racist” is an insult, according to a recent New York Times/CBS News poll, fully 70% of Americans say race relations in the country are generally bad. Recent events – more police killings of unarmed black men and the murder of five white policemen by a black militant – might seem to support that dire contention. But, ironically, the shock of all the bloodshed has evoked something heartening. The recent police killings of peddler Alton Sterling in Baton Rouge, Louisiana, and of Philando Castile during a traffic stop near St. Paul, Minnesota, angered many blacks (and whites). They were only the latest in a list that includes Michael Brown, Eric Garner, Walter Scott, Freddie Gray… and others. And yet, unlike in some times past, the many protests of the recent killings were free of violence – at least until the police keeping order at a Dallas protest came under a sniper’s fire. 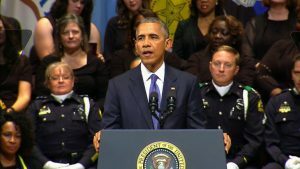 At a July 12 memorial in Dallas for the murdered officers, Mr. Obama spoke eloquently and pointedly. And the “targeting of police by the shooter,” he said, was “an act not just of demented violence, but of racial hatred” against whites. And then he quoted the navi Yechezkel: “And I will give you a new heart, and a new spirit will I put within you… I will take away the heart of stone… and I will give you a heart of flesh.” (36:26). “You can protest,” he said, “but I want everyone to protest the right way. With peace. No violence – none whatsoever.” His mother called the Baton Rouge attack “despicable.” Protest groups felt compelled to distance themselves from the violence. Only time will tell if recent days will prove to have been a watershed in the troubled history of race in America, or if even any lasting good at all will emerge from all the recent bad. But the words of a president and a bereaved teen and his mother provide some reason for hope.